Back in May 2014, Arthur and I took a transatlantic cruise from Miami to Barcelona on the Norwegian Epic. 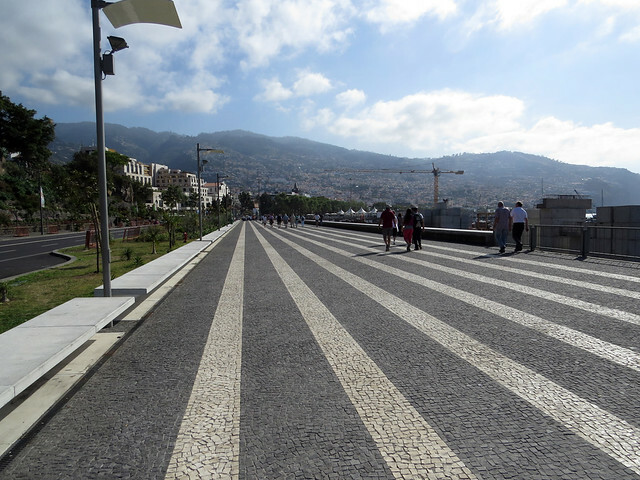 Along the way we had one stop — one day in Madeira. 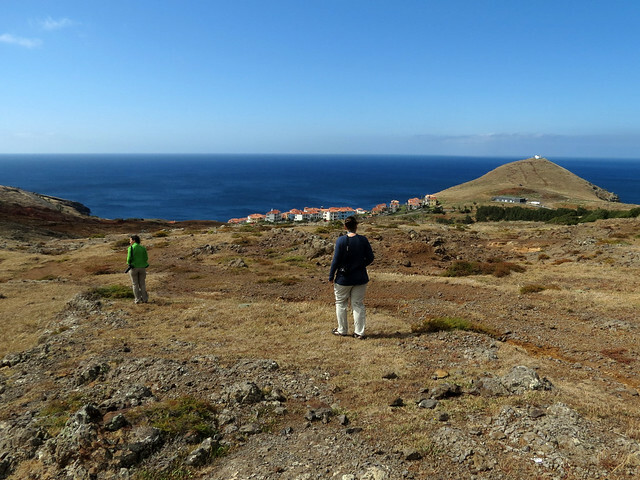 We hired a private bird guide, Catarina from Madeira Wind Birds for the day; we had a great time. 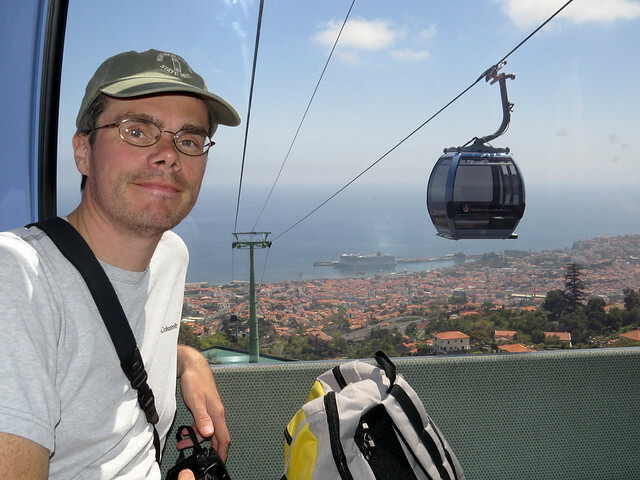 We didn’t have high expectations for the outing, especially since the ship arrived in Funchal port late in the morning, past prime birding time. Our first checklist started at 11AM! In the end we ended up seeing 26 species over 8 checklists, with 8 lifers. 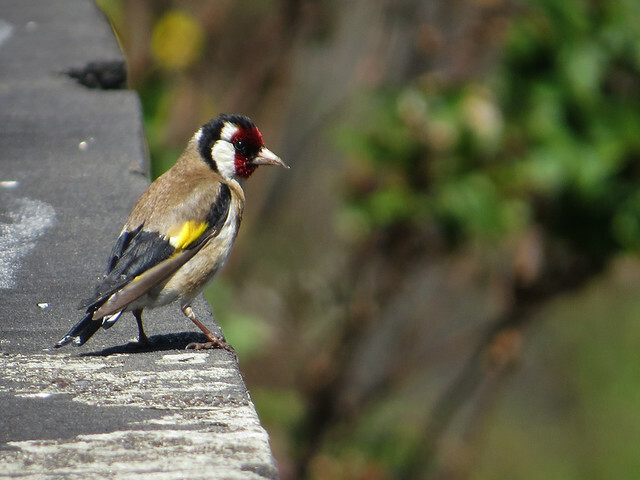 Our bird list is at the end of this post. We watched as our ship approached the island. 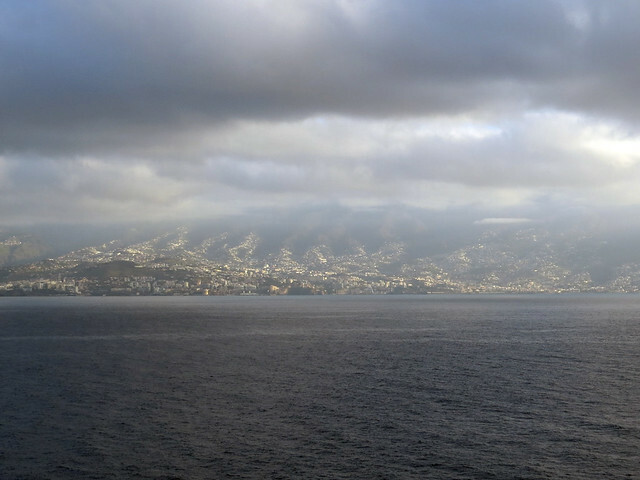 It was covered in clouds and hard to see — our first impression was that we would have a dreary day, but this misty, cloudy start is typical of Madeira. By the time we could disembark the skies had cleared. We walked off the pier and met our guide. 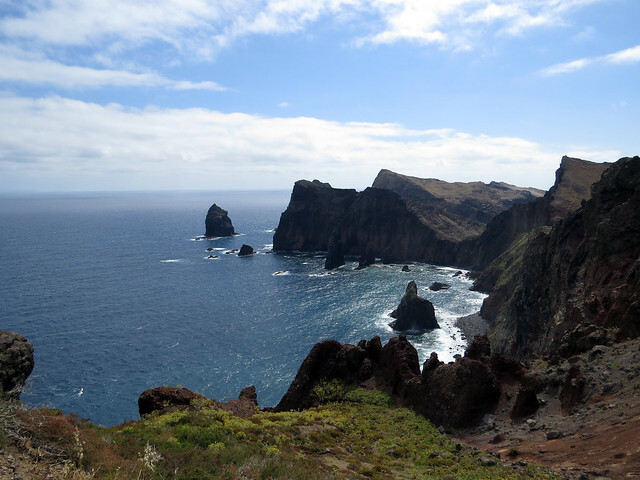 Our first stop, Ponta de São Lourenço, was at the far eastern side of the island. Here we successfully searched for Berthelot’s Pipit. 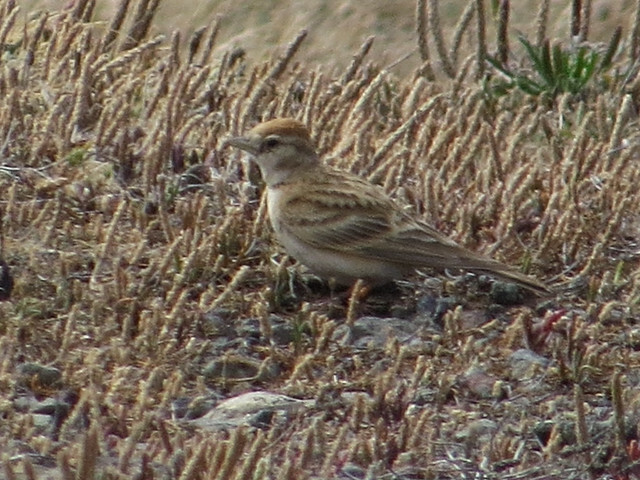 In the windswept fields we also found a lark which we had trouble identifying in the field. 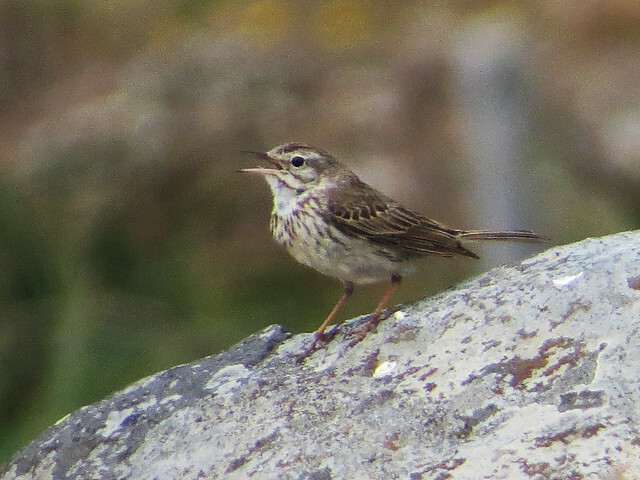 Using photos and our guidebooks we were able to ID this bird as a Greater Short-toed Lark with the help of our guide Catarina. 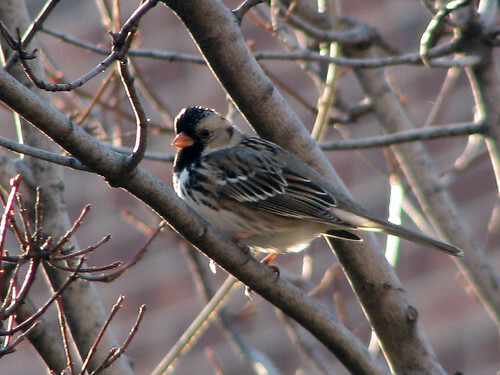 This bird is considered a rare vagrant on the island. On the way to our next stop we picked up Spanish Sparrows nesting in urban palm trees. 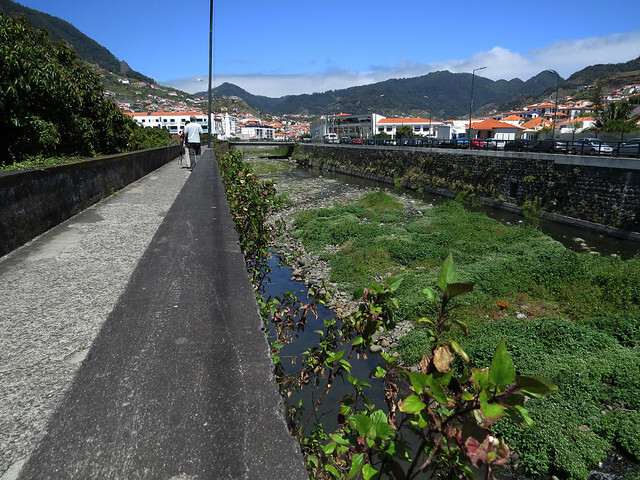 Along the water at Porto de Recreio de Machico we added 8 species. 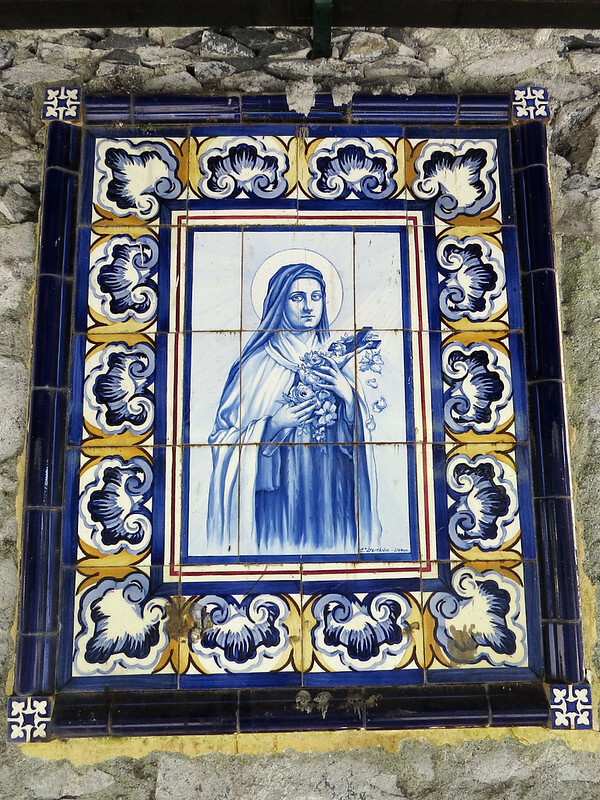 At our final stop, Santo António da Serra, we successfully searched for Madeira Firefinch. This is a local subspecies that we didn’t think we would find, considering the time of day. It was a lucky tick, though I was not so fortunate with my camera. Driving back to Monte, we spotted a Eurasian Kestrel hovering over the airport. 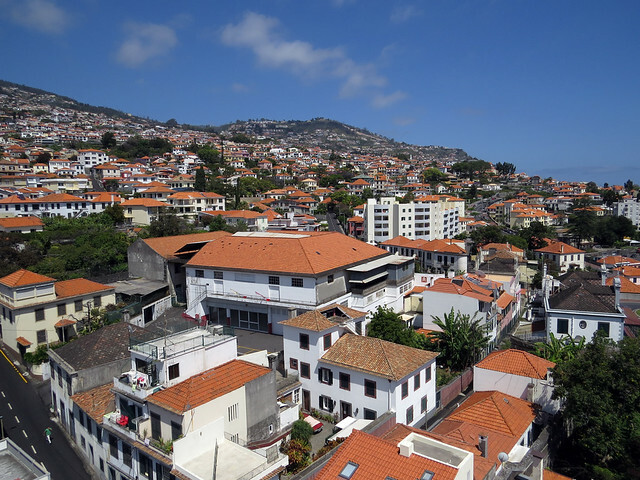 Arthur and I had lunch in Monte and looked around a bit before taking the scenic Teleférico do Funchal aerial tram back down to the port. 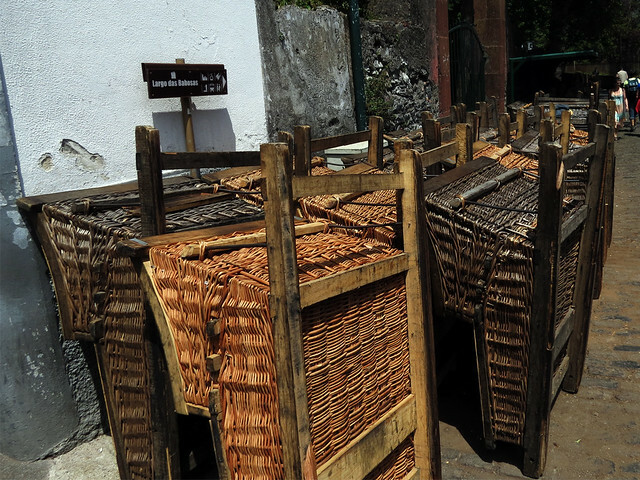 The other fun way to descend from the town of Monte back down to the port is via toboggan. We watched the drivers for a bit before we got on the tram. 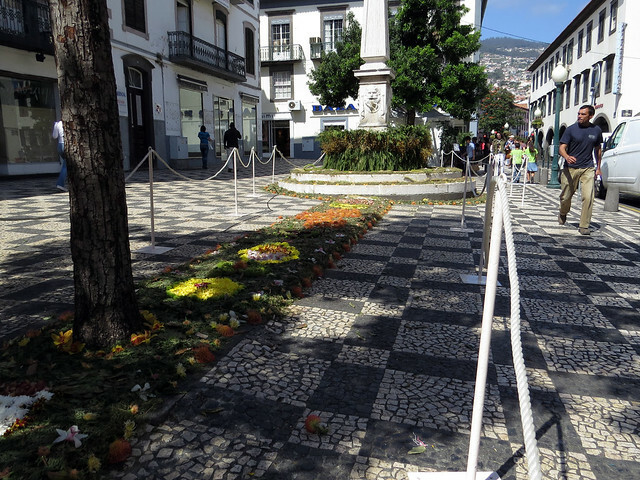 The Madeira Flower Festival was winding down during our visit, so we saw lots of flower displays throughout Funchal as we walked back to the Epic for the continuation of our journey from Miami to Barcelona. Yesterday I decided to sleep in and skip a morning bird walk. Of course this resulted in me feeling antsy by the afternoon, so after a surprise soaking afternoon rain I headed out the door and biked to Gemini Springs. It was just about half past three and the clouds persisted. It looked like it might rain again at any moment so in the dreary weather I took an accelerated hike through my usual haunts. It was a nice short walk and I picked up 35+ species, a good total considering the time of day. I walked back to my bike, stowed my gear, and headed out of the park, intending to make one last quick stop at a stand of snags to see if an immature Red-headed Woodpecker was hanging out in its usual spot. It was. Target acquired, I straddled my bike and was just about to leave when a small flock of birds landed in the grass between the bike path and the snags. I scanned the flock, finding only Yellow-rumped Warblers. The last bird my binoculars landed on was partially obscured by grass, but I could see a stocky reddish figure scooting in the grass — just like a Fox Sparrow. 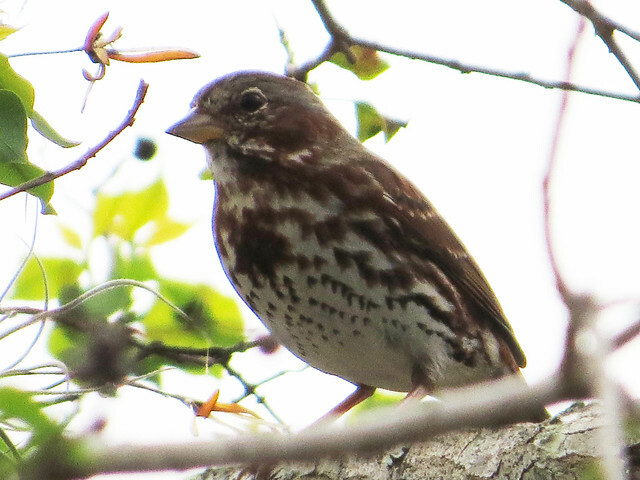 To give you an idea why I was so excited at the prospect of finding a Fox Sparrow at my local patch in central Florida, here is a USGS map of Christmas Bird Count sightings. This gives a good idea of the winter range for this species. I watched the bird for just about a half minute before fumbling to leave my bike (which I was still straddling) and fumbling for my camera. In my clumsiness and excitement I lost sight of the bird. Oh noes! This morning, Arthur and I returned to Gemini Springs and Arthur spotted the sparrow in the same general area where I found it yesterday. I wonder how much longer the bird will linger here? 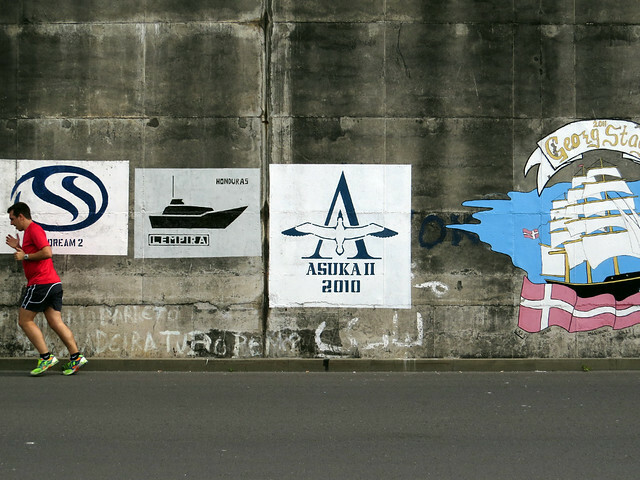 Some migrants are already on the move. It probably won’t be too long for the Fox Sparrow, either. If you want to be a better birder, observe the birds, right? Even the common ones. Especially the common ones. Learn them backwards and forwards so you’ll recognize something special (they’re all special!) when it comes along. Arthur and I visited Fort De Soto Park in Pinellas County, Florida last month. It was a short visit, just four hours or so to explore one of the most productive and popular birding spots in the state. We hit a few parts of the park and then ran into a birder whose name I knew (and she knew mine, blush) from the state birding listservs. She showed us around a part of the park known as a warbler hotspot and helped us look for a couple of overwintering grosbeaks (neither of which were located that day). Despite the dips, it was great to meet someone who knows Fort De Soto so well and to put a face to an email name. 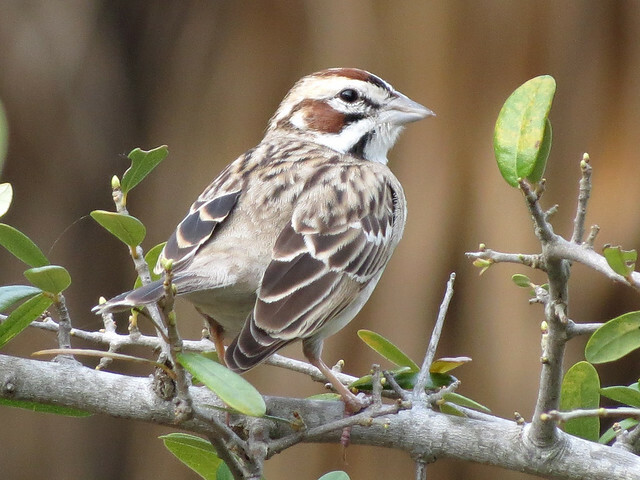 In addition to the Rose-breasted and Blue Grosbeaks recently seen at the park, I knew that a Lark Sparrow (which is not normally found in Florida) had been hanging out there, but I didn’t know where exactly (I was unprepared; the trip to Fort De Soto was rather impromptu). 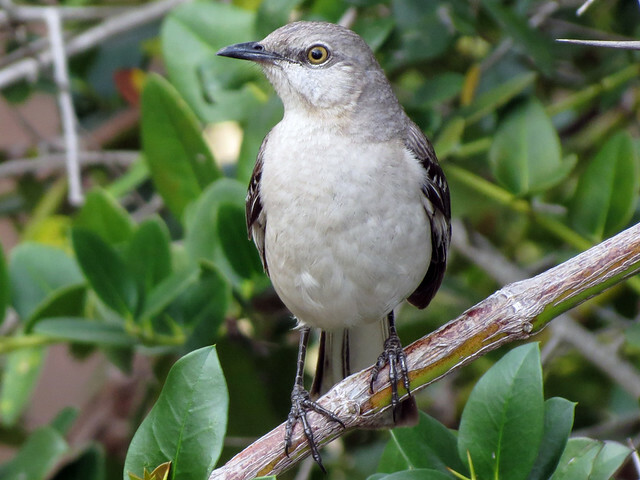 As we walked back to the car at the end of the day, I stopped to observe and photograph a Northern Mockingbird. It had just popped out of a bush and was perching in the open, posing nicely while it looked around the immediate area. I noticed something moving inside the bush, and suddenly the mockingbird flushed. This is what took its place. Observe the birds. Even the common ones. You never know what you’ll learn — or who you’ll see. I wanted to do something special for my birthday last month, so I started planning a little getaway to the west side of the state. I was looking to chase a few birds, see a different part of Florida, and just bum around a bit. My original itinerary had Arthur and me hitting 3 or 4 hotspots a day over a long weekend, racking up life birds like Burrowing Owl, Snail Kite, and Red-cockaded Woodpecker. In the end I decided to scale down our adventure to just two days centered around the Tampa Bay area, and our first stop after an early morning wake up call on Sunday, February 26th was Possum Branch Preserve in Safety Harbor, Pinellas County. 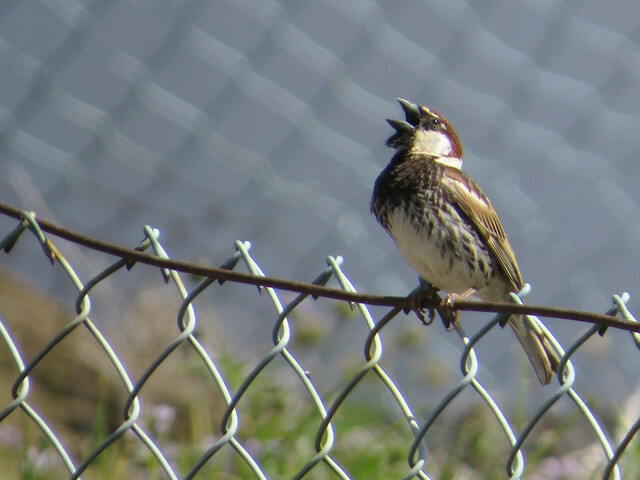 We were there to look for a western sparrow that had been seen regularly since December 10, 2011. 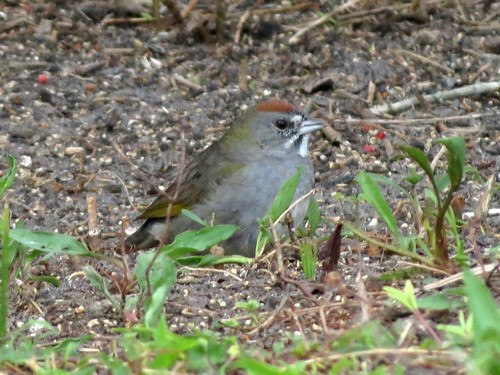 The bird, first thought to be only the 5th or 6th* Green-tailed Towhee ever recorded in Florida, must have been seen by hundreds of state birders. Thanks to regular mailing list posts by those who went out to see the bird before us, we had extremely detailed directions to follow when we went twitching over two months after the initial sighting (is it still considered twitching after so much time has passed?). We arrived in cool, rainy conditions, but were lucky to find the bird immediately upon arriving at its favorite haunt. It scratched, foraged and fed nearly continuously for the half hour we were there. *This has been an exceptional season for Green-tailed Towhees in Florida. There may have been up to 8 different birds in the state in the past 12 months. Saturday was a busy day. Arthur’s family had just left us the day before, following an excellent and busy two-week visit. 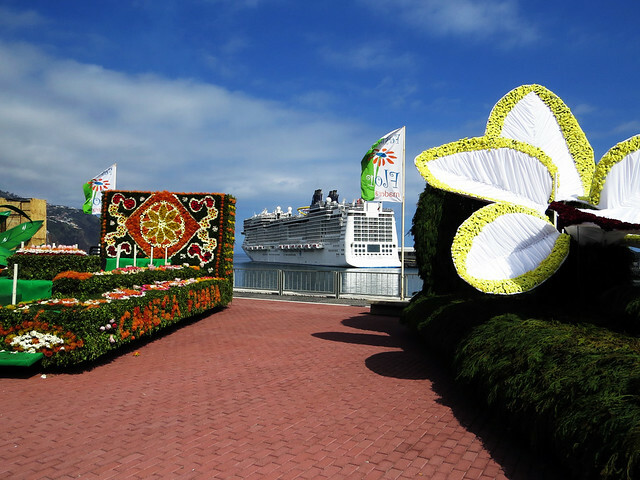 We had been to theme parks, nature preserves, restaurants, beaches, historical sites, shopping malls, and more. So Saturday was a day for a bit of relaxing, but also laundry, straightening up, and getting settled back into our offices, which had been turned into guest rooms. 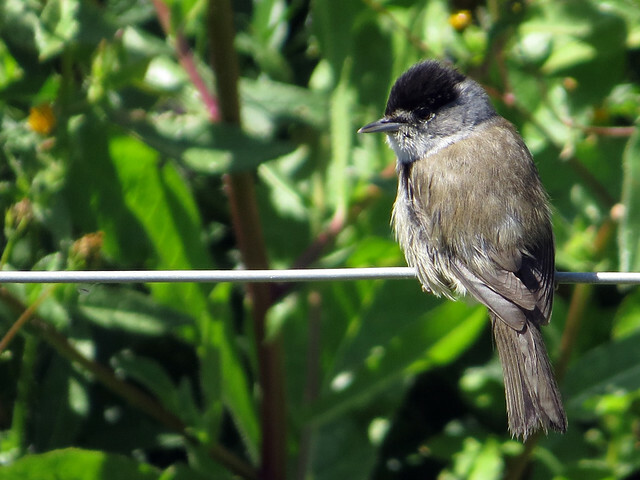 The day also included a bit of yard birding, as you do. When chickamice are cheeping, the impulse to rise and check the feeders is automatic. Cheeps called us to the window at about 4:30PM. While I was watching Tufted Titmice, Arthur found a yellow bird that he didn’t immediately recognize. He tried to point it out to me, which shouldn’t have been too hard, considering the modest size of our yard, but I couldn’t find his bird. He speculated what it might be while I remained clueless, searching for movement about 10 feet too high from where I should have been looking. Finally I spotted a tanager-like bird in our orange tree. I’m not overly familiar with tanagers, but my first thought was that it was a female Summer or Scarlet Tanager. 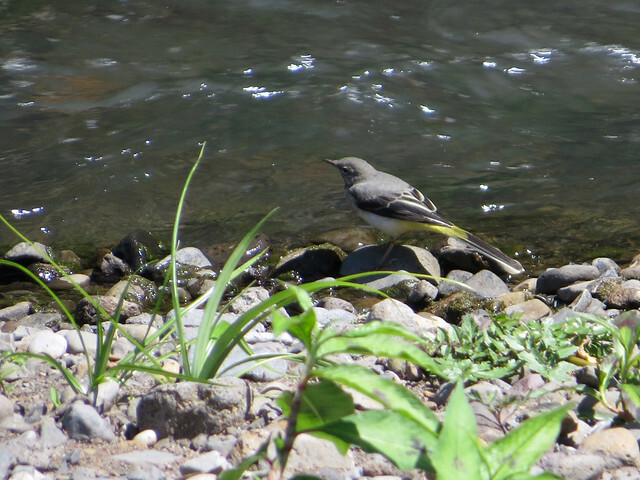 I noted it was a yellowish bird with dark wings and strong whitish wing bars. During this initial viewing I didn’t notice (or remember) the color of the beak, but I must have registered the general shape, because that’s what would scream “tanager” versus “oriole” or something else to me. I observed the bird for a minute or so before I lost it. I reached for Sibley while Arthur kept watch on the yard. So Sibley clearly lets me know immediately that both Scarlet and Summer Tanagers don’t show strong wing bars. But Western Tanagers, far out of their normal range here in Florida, do. Holy crap! This was getting exciting. I went for my camera and hoped the bird would be spotted again. Arthur to the rescue. 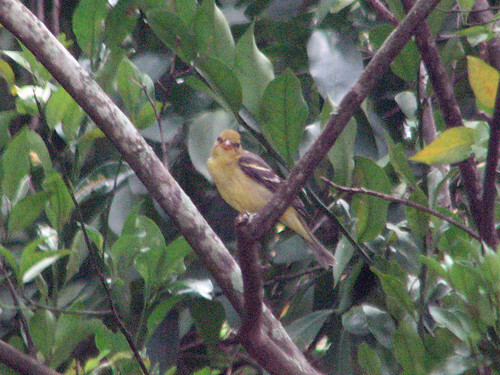 He found the tanager again and I managed to take some photos. Now I noticed the pinkish beak. Western Tanager! Lifer! In OUR YARD! Boo-yah! Boy, am I glad I got photos! Obviously the bird is well out of range, but I had no idea how often they visit Florida. 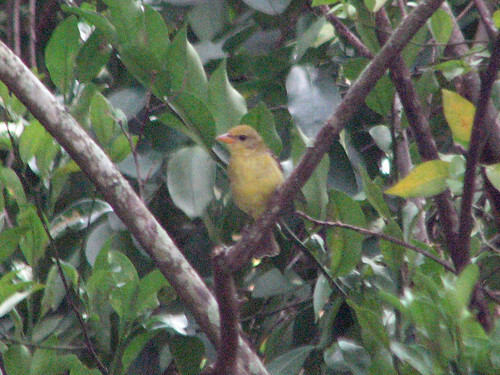 When I posted to the Florida listserv, birders replied to me privately that our Western Tanager might be a first for Volusia County. Whoa. I later learned from Michael Brothers that there are just two previous records: January 1957 in Ormond Beach and February-March 1968 in New Smyrna. 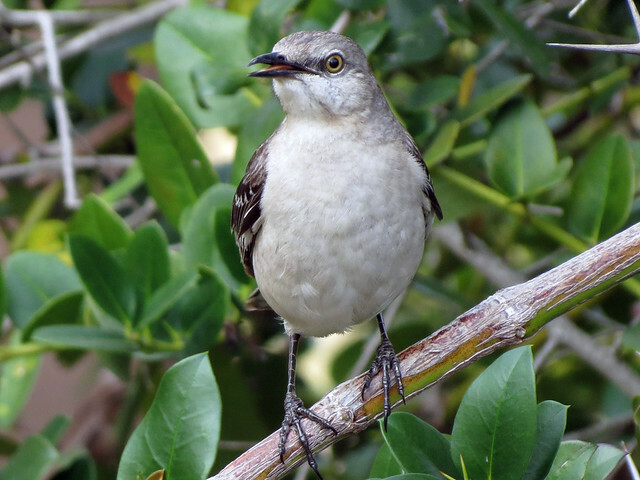 I was also urged to report the sighting to the Florida Ornithological Society, so it might be officially recorded (like the 1957 and 1968 birds), a process which I have started. We saw the Western Tanager late in the day on Saturday. After dark, we went on a food run, picking up oranges and grape jelly. Apparently Western Tanagers will feed on the same types of food as orioles; I saw the tanager eat at least two large insects Saturday afternoon. Sunday morning we placed the jelly, two orange halves, and an oriole feeder with sugar water at one of our feeding stations, along with a camera. 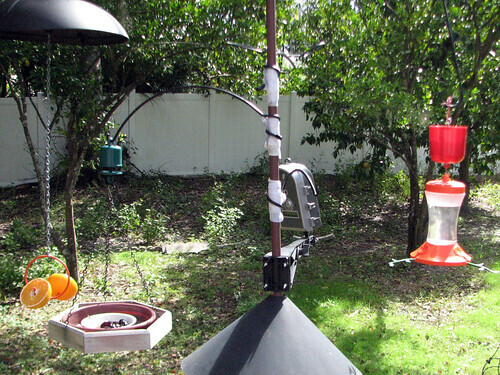 As of Wednesday afternoon, the camera hasn’t recorded a single visitor to the feeders. We did have a second, extremely fleeting sighting of the Western Tanager on Tuesday afternoon. 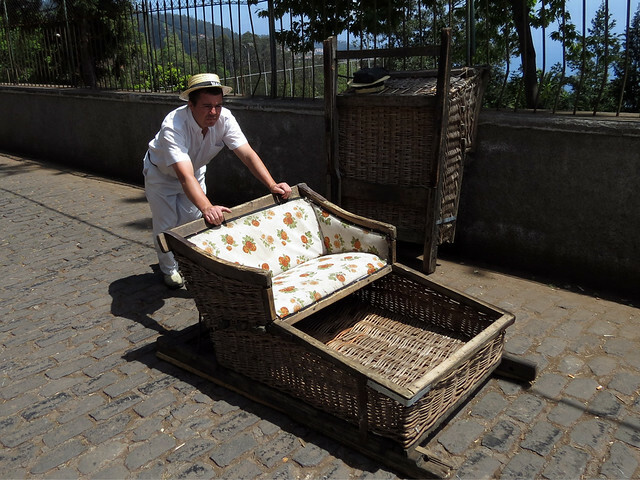 Arthur spotted it (natch) and got me on it, but it flew off after less than a minute. I know there are several local birders that would love to see the bird. I would love for it to stick around! We’re keeping our eyes peeled! We don’t often chase rare bird alerts. When we do, we’re skunked more often than not, it seems. I suppose we are not exactly alone in that regard. 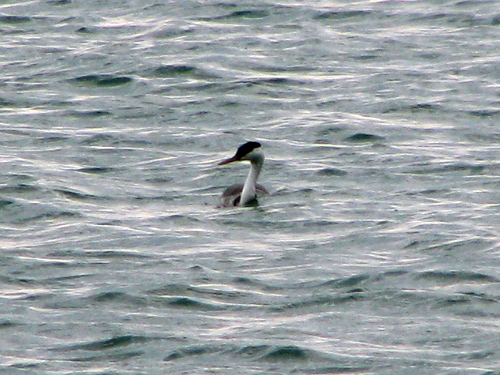 Thursday afternoon a Western Grebe was reported at Waukegan Beach, which is about 30 minutes due east from our home. Meh. Friday it reached into the 60s with bright sunshine. Grebe was still there, along with a White-winged Scoter. The forecast for Saturday was three inches of snow. Well. At 4pm it was decided we had to go outside and enjoy the last day of winter, and so we headed east for the lake (Michigan, that is). Luck was on our side again; as we got out of the car we noticed our buddies Rena and Sonny Cohen heading out onto the pier. When we caught up they got us on the scoter almost immediately. There was no sign of the grebe, but Sonny & Rena said they were going to try the Government Pier on the other side of the beach. Government who now? We followed them to a different parking lot and we all walked out together. 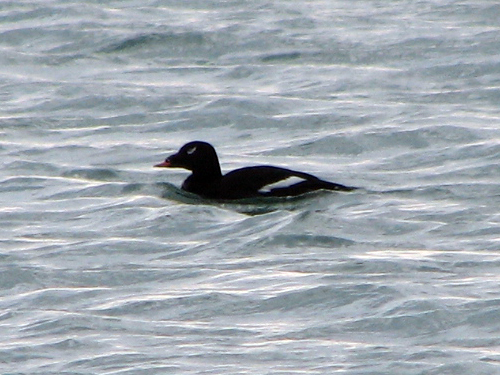 Again the scoter was seen right away. And then there was the other star bird, swimming behind the scoter. Eventually both birds came in much closer, giving all four of us killer views (despite the photos!). Here’s hoping we can keep up this lucky streak of bird-chasing. A Snowy Owl was spotted on Texel last Saturday and is still being seen on the Wadden island. The young female owl has been spotted on the polder ‘Eijerland’. Since the first sighting on Saturday, hundreds of birders have visited Texel hoping to see the rare bird. Snowy Owls normally live on Greenland, in northern Scandinavia and Siberia. It is unknown how or why the young female bird is so far out of her range. Experts say there is plenty of prey for the bird to survive on the island, should she stay. A Black Lark has been spotted by British birders at the sand dunes of Winterton-on-Sea. 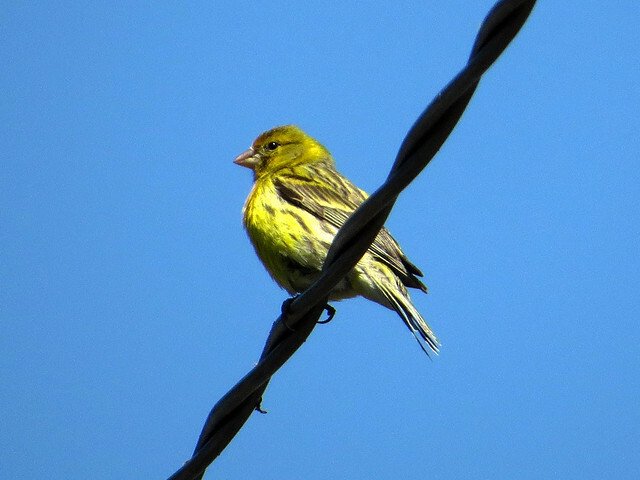 The bird was first reported by a Winterton-on-Sea resident on Sunday afternoon. Since the sighting was posted online, hundreds of twitchers have come to Winterton-on-Sea to try and get a glimpse of the rare bird. The Black Lark is native to Russia and Kazakhstan. 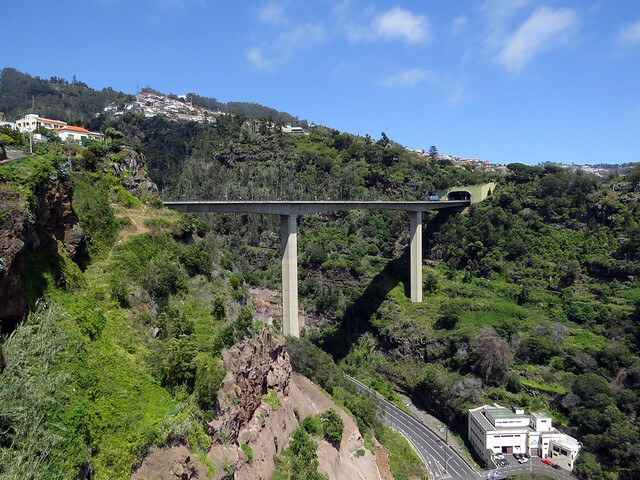 It has only been seen in the United Kingdom twice before: once in 1984 and again in 2003. In the 1950’s, the farthest north a Ringed Kingfisher was ever seen was Mexico. In the early 1970’s, a Ringed Kingfisher nest was discovered in south Texas. The Green Jay is another species that used to come no farther north than Mexico’s tropical forests. Today, they are known to breed in central Texas. Read more in the article Expert: Birds flee to beat the heat. 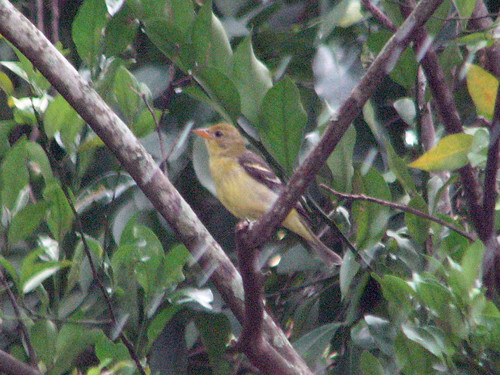 A female Western Tanager was spotted in Grandview Heights, Ohio last week. 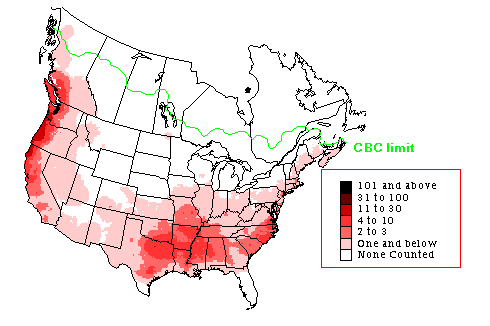 The bird’s normal range is in the western United States, particularly in the Rocky Mountains. Prior to this year, confirmed sightings of the Western Tanager in Ohio were recorded once in the 1980’s and once in the 1990’s. This year there have been three verified sightings. Read more about the Tanager’s visit to Ohio.